It comes the time of year when the verdant veggies are most abundant and we quickly pass from gratitude for the fresh leafy greens to a feeling of: Ho-hum what to do next with those endless bags of antioxidants? So the following are some creative ways to use them and add a decidedly creative pinch of flavor. 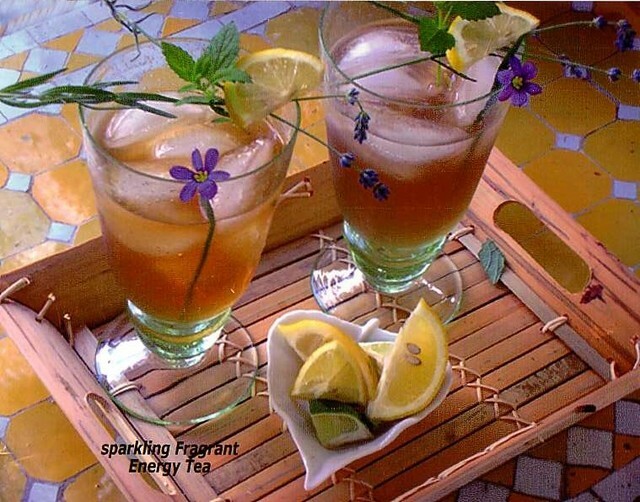 A food professional will often use 8 tea bags to make 1 gallon of ice tea. Keep that as your general rule and then add herbs as desired. If you want a bit of intrigue to your iced tea, you can add 2 cups of fresh pureed watermelon juice or even 2 cups of apricot, cranberry or other berry juice. In a medium saucepan bring the ginger and water to a boil. Turn off heat, add tea bags and herbs, and cover and let steep for 1 hour. Add honey to taste. Ice can now be added to equal 1 gallon if using immediately. Or refrigerate and add cold water when serving. This layered combination of vegetables and ricotta is blanketed with a pie crust dough in a quick wrap to enclose the scrumptious filling. Rustically elegant, it says fresh and homemade without being fussy. As a brunch entree it’s outstanding. For dinner it complements grilled beef, pork or lamb nicely. Bake 375 about 30 minutes or until the dough is golden. "The mixture of ingredients is a taste explosion." This simple combination of leafy green lettuce, sweet red onion, sliced apple, roasted pecans and dried cherries tossed in a raspberry vinaigrette can serve as a main lunch entrée or on the side in a more extravagant meal. Add the flowers as the “Knock Their Socks Off” garnish! To talk a bit about Arugula flowers, you actually have to taste them. They impart a delicate version of the arugula leaf which can often be very spicy. (Of course the very spicy is extremely nutritious). Toss the lettuce, onion, apple, pecans and cherries in a large salad bowl. Pour on enough dressing to coat and toss the salad. Garnish with gorgonzola cheese before serving. Add the flowers as the “Knock Their Socks Off” garnish!